Cool Technology. Even Cooler Results! Say good-bye to muffin tops, love handles and spare tyres. Naturally! Inner Sydney Dermatology introduces CoolSculpting®, a breakthrough, non-invasive procedure that uses cooling technology to eliminate unwanted fat without causing damage to other tissue. CoolSculpting® is a brand new way to remove unwanted fat around the waist, hips, thighs, back and arms. This revolutionary treatment was developed by Harvard scientists, and targets fat cells by freezing them and causing their natural death in the treatment area. CoolSculpting® is not a solution for obesity, but targets stubborn bulges of fat, that despite diet and exercise just won’t budge. It’s completely non-invasive so there is no cutting, no needles and no downtime. Patients typically read, work on their laptops, listen to music or relax during the procedure. Most patients will see a noticeable reduction of fat in the treated area after one visit. However, you can choose to have additional appointments depending on the results you wish to achieve. The fat cells are naturally eliminated from your body over the following few months, leaving you feeling more like yourself again. And what’s more, as long as you maintain your weight with normal diet and exercise, your long-term results should remain stable. Call our trained staff to arrange a free consultation now! Inner Sydney Dermatology introduces CoolSculpting®, a breakthrough, non-invasive procedure that uses cooling technology to eliminate unwanted fat without causing damage to other tissue. 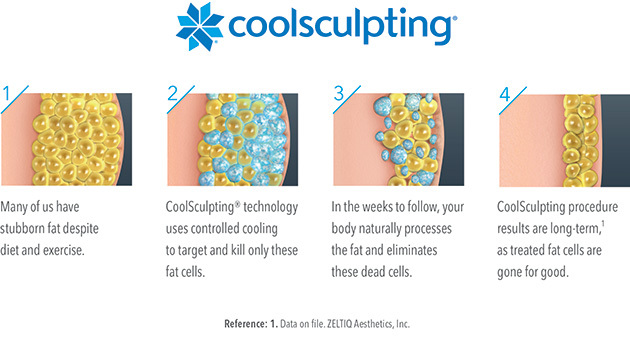 CoolSculpting® is a brand new way to remove unwanted fat around the waist, hips, thighs, back and arms. This revolutionary treatment was developed by Harvard scientists, and targets fat cells by freezing them and causing their natural death in the treatment area. CoolSculpting® is not a solution for obesity, but targets stubborn bulges of fat, that despite diet and exercise just won’t budge. It’s completely non-invasive so there is no cutting, no needles and no downtime. Patients typically read, work on their laptops, listen to music or relax during the procedure. Most patients will see a noticeable reduction of fat in the treated area after one visit. However, you can choose to have additional appointments depending on the results you wish to achieve. The fat cells are naturally eliminated from your body over the following few months, leaving you feeling more like yourself again. And what’s more, as long as you maintain your weight with normal diet and exercise, your long-term results should remain stable. Call our trained staff to arrange a free consultation now!